Filed to: Wow!Filed to: Wow! Toot toot! I have discovered the apotheosis of transit and it is a hot tub tug boat. 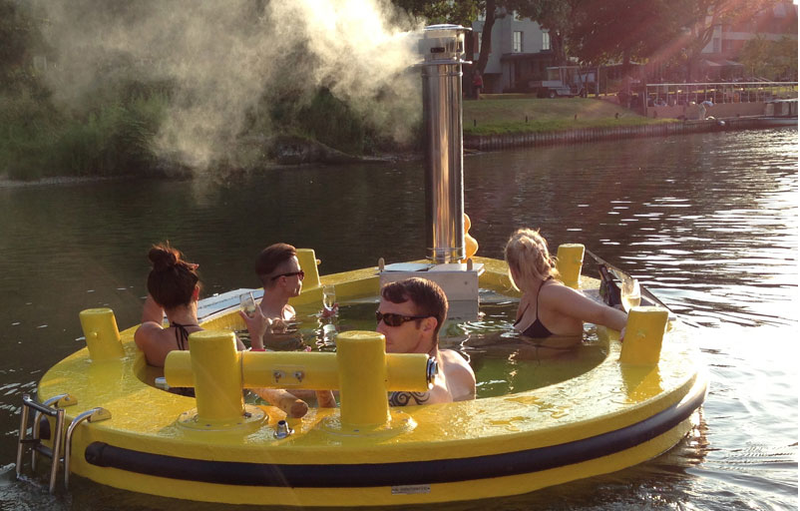 HotTug is both real and as incredible as it sounds, a hot tub that doubles as a BOAT. The HotTug fits 6 to 8 people, contains 1800 liters of water, and is objectively awesome. Dutch designer Frank de Bruijn created the perfect machine after recognizing that the world of leisure boating had a tug-boat sized hole. It comes with a stainless steel stove and a glass-fiber and wood body. Don't worry about coming too close to the stove in your bathing suit; it has been designed to stay cool enough to avoid burning passengers. The only flaw that the HotTug possesses is that it is only available to rent in select European cities like Copenhagen and London. The slogan for the TugBoat is "unexpected freedom." As it should be. As it should be. Toot toot!